Photo: Ajman Civil Defence honoured Farouk Islam Nour Al Haq, a Bangladeshi national, for saving the life of a three-year-old boy who was flung from a burning building. 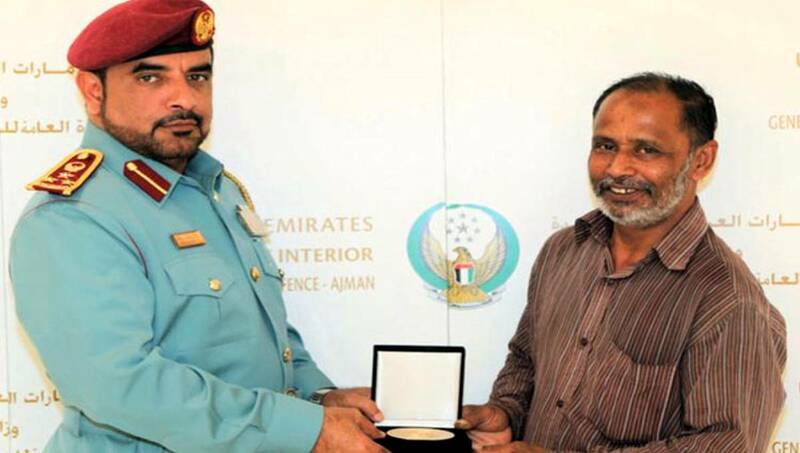 Dhaka, Jan 17 : A Bangladeshi in Ajman was recognised by local authorities for his exemplary bravery and heroism when he rose to the challenge and saved the life of a three-year-old boy. When a massive fire engulfed the three-storey apartment building in Nuaimiah on Saturday night, thick, black smoke filled the flat in no time. The mother couldn’t find a way out – except through the window. She was worried about their son who already had started to suffocate, said her husband Mohammed Saqib, who was at work when the incident happened and got a frantic call from his wife. “My wife Rubeena said she couldn’t go through the doors and she would not survive the heavy smoke. I told her to relax and think of a way to save herself and the child,” he said. “I left everything in my hand and ran towards my car to get home as quick as possible,” Mohammed said.